Delivery from £5.90 to United Kingdom in 2 - 5 working days. Store knives and utensils safely, hygienically, close at hand. No prescriptive slots, no restriction on use and you see the knife blades making selection a sinch. 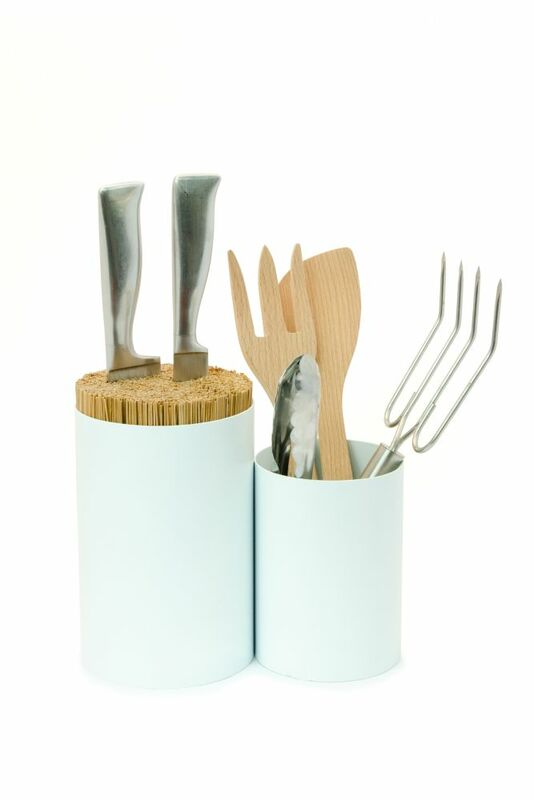 Features numerous bamboo rods, to cleanly and gently look after your knives. Spoons, spatulas and ladles go in the adjoining pot. Available in a range of neutral and accent colours designed to suit your style. Made from steel, hard coat, durable epoxy paint and bamboo. Knife & Spoon, every cook's, kitchen condiment. Design by Lincoln Rivers. Clean using a damp soapy cloth. Do not store damp or wet knives. Keep bamboo dry. Bamboo rods can be removed if more storage space is required.